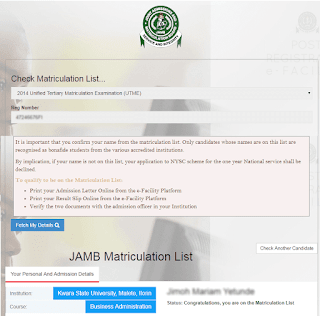 Why do I have to cancel my jamb (utme) registration and re-enrolled. If you made a mistake such as such as wrong date of birth, spelling of name(s) and local govt. of origin and you think that it will affect you during admission process (physical clearance). Personal reason best know to you. When is cancellation of registered form possible? During the valid period of registration. Is it only Jamb CBT center that can cancel my registered form? No. if you have the details listed below you can do it yourself. 7. A message show saying “Cancellation of Registration allows your to cancel your current credentials and registration, rendering the PIN invalid. However, if you wish to make a new registration you can do so by purchase a new card. Click "Cancel Registration" button to cancel otherwise close this page now!!!" to continue the cancellations, enter the correct date of birth used to register the form and click on cancel registration.